Happy New Year - thanks for stopping by! To keep the bad pun alive from yesterday (wherein I said the last day of the year was the "sunset"), then that would make today the "sunrise" since it's the first day of the new year! 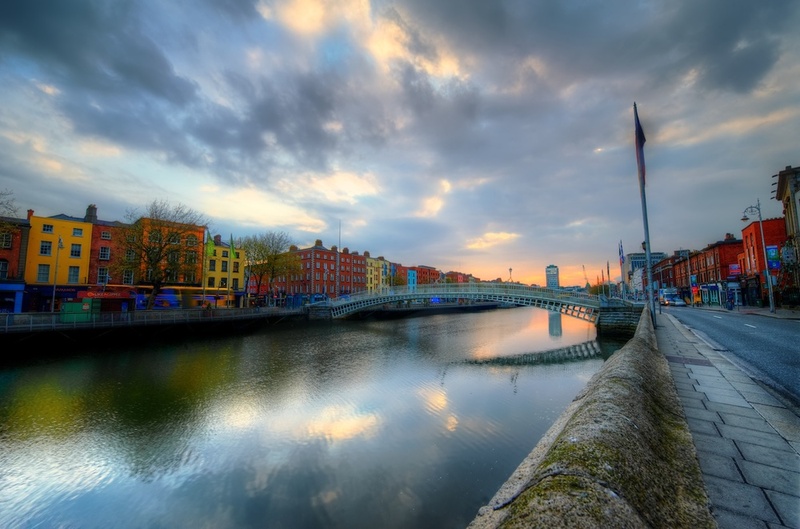 With that in mind, here is a sunrise photo from that most lovely city in Ireland - Dublin. I love that town. Great people, great culture, great accent (! ), and great photo opps. Oh yeah, and the Guinness is great too! I don't know yet if I will make it there again in 2014, but I sure hope so. I grabbed this photo during my last visit there, on the morning I was flying home. I was ready to go before the taxi arrived to whisk me off to the airport, so I ran around for about 15 minutes and took a few shots, since a beautiful sunrise was happening and well, it's hard to pass up something like that!